It was going to be the last re-enlistment ceremony Jesse Siordia Jr. would ever plan. So, why not go big? Ready to re-up for six years after serving 14, the operations specialist second class decided to try and book country music superstar Toby Keith for the gig, hoping to connect with the singer June 16, when Keith’s “Hammer Down” tour rolled through Detroit. Siordia, a reservist with Navy Operational Support Center Detroit, started sending emails to everything with Keith’s name on it: Websites, record companies, casual dining establishments — “I went after everything I could possibly find,” he said. No response. The reservist had seen Keith last year in Afghanistan while serving a 10-month hitch as an individual augmentee with a Kabul-based intelligence unit. He had tickets to the Detroit show, figuring that was about as close as he’d get to his favorite musician. As a “last resort,” though, he emailed Dr. Don Carpenter, host of the morning show on WYCD-FM (“Detroit’s Country”). A 30-year radio vet (and before that, an actual animal vet) who is going into the Country Radio Hall of Fame this year, “Dr. Don” is no stranger to pre-concert fan letters. Lt. Cmdr. Charles Collins from NOSC Detroit was on hand to make things official. Siordia’s wife, Melissa — who pushed the sailor to reach out to the singer — also was in attendance. The whole thing took about a half-hour — plenty long enough to make a lifelong impression. Siordia even got a bonus: Walking around backstage in his crackerjacks, he bumped into Detroit mainstay Kid Rock. Literally: While the sailor was soaking in the VIP experience, the singer was chatting on his cellphone. Call it a brush with greatness. Siordia, whose full-time job is with a bank in Troy, Mich., served on active duty until 2007 and had targeted a 20-year retirement until he got some good news: He’ll soon be OS1 (SW) Siordia. This is awesome! 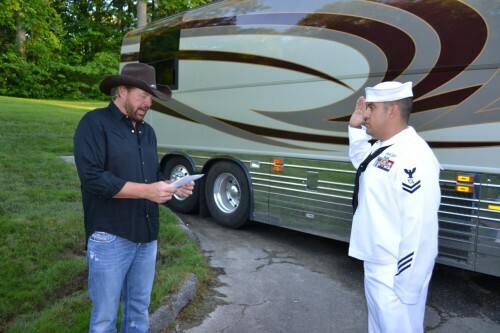 My hubby recently got to meet Toby Keith, shake hands and take a picture while he was on deployment on the USS Emory S Land. I have to say it made his day! A country singer with torn jeans, shirt hanging out, and wearing a cowboy hat gives the oath of enlistment (albeit with an officer on hand to make it official)? Ridiculous. In the Air Force, we have regulations that try to prevent re-enlistments from becoming mere publicity stunts. What’s next, sailors will have favorite adult film stars reading their oaths? Doesn’t the enlistment oath have to be taken in the presence of an American flag? Defective enlistment? Federal law requires everyone who enlists or re-enlists in the Armed Forces of the United States to take the enlistment oath. The oath of enlistment into the United States Armed Forces is administered by any commissioned officer to any person enlisting or re-enlisting for a term of service into any branch of the military. The officer asks the person, or persons, to raise their right hand and repeat the oath after him. The oath is traditionally performed in front of the United States Flag and other flags, such as the state flag, military branch flag, and unit guidon may be present. Looking to the requirements of enlistments as covered by federal law in 10 U.S.C. § 502, the enlistment is on shaky ground. In comes down to whom administered the oath, and in this case the country singer actually administered the oath while the commissioned officer was merely a passive observer. The officer then probably signed the DD Form 4 and attested that he in fact administered the oath, which from a legal standpoint could be seen as be a material falsehood. As for the presence of an American flag in the ceremony, aside from clear service tradition, only the Army appears to take this seriously to the point of being specified by regulation in AR 601-210 (“Make a suitable arrangement to ensure that the oath is administered in a dignified manner and in proper surroundings. display the U.S. flag prominently near the officer giving the oath.”) Apparently the U.S. Navy does not hold the flag to be so dear to the ceremony.